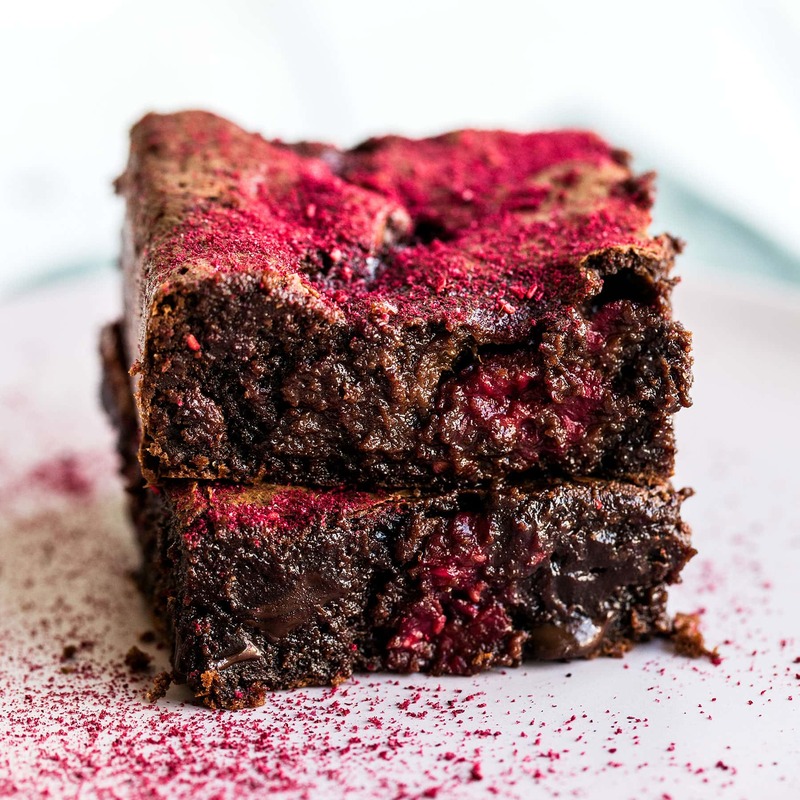 This Raspberry Brownie Recipe is ultra rich and fudgy with gooey chocolate chunks and fresh raspberries studded throughout. 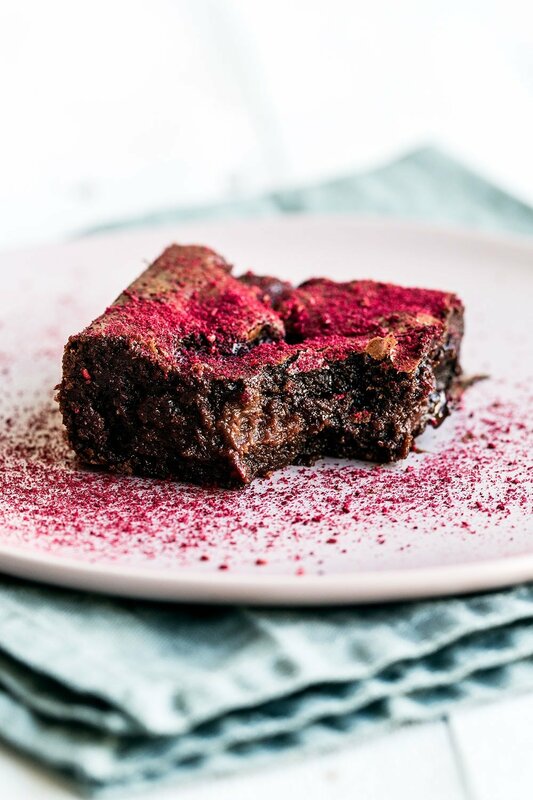 Garnished with raspberry powder on top so it's perfect for Valentine's Day! Taste: Tons of raspberry flavor, which pairs so perfectly with chocolate! Texture: Ultra thick, rich, fudgy, and gooey. Ease: Super simple and easy! 1 bowl, less than 1 hour. Pros: Fun, flavorful, and festive twist on a classic brownie recipe. Would I make this again? Absolutely, even though they’re dangerously addictive!! You guys know my love for brownies is almost unmatched. I would take a gooey fudgy rich brownie over a piece of cake ANY day. Which is why I’m always experimenting with new brownie recipes, textures, and flavors. I knew I wanted to create a simple chocolate recipe for Valentine’s Day and thought brownies would be perfect. They’re easy to make, transport, and share for any party or potluck. So for this Raspberry Brownie recipe I started with my Best Easy Brownies as the base. I made a few tweaks to produce brownies that are even more rich, moist, and fudgy. Then I added in raspberries in TWO forms for the best flavor and texutre. The result? 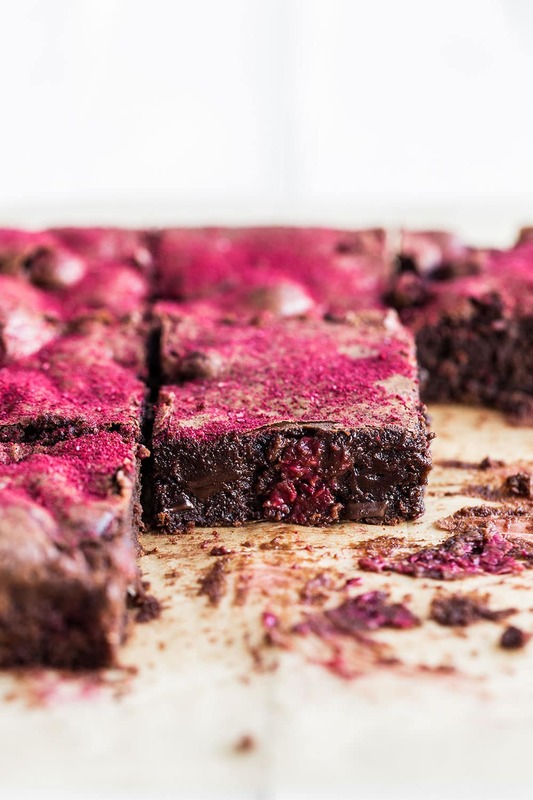 A Raspberry Brownie Recipe that probably won’t last longer than a day before it’s devoured. The extra egg yolk in this recipe helps to make super rich, chewy, and fudgy brownies. So does the chocolate in three forms: melted semisweet chocolate, cocoa powder, and chocolate chunks. I find that for classic brownies using a combination of both melted chocolate and cocoa powder produces the best results. Tons of chocolate flavor but also still moist and fudgy. For fudgy brownies, it’s important that the batter is very moist and rich. That’s why we use a relatively small amount of flour and cocoa powder. Enough flour to provide structure and chew, but not too much that the brownies are dense or cakey. Enough cocoa to provide that rich chocolate flavor, but not so much that the brownies are dry. You’ll notice there’s no baking soda or powder in this recipe. That’s because they would create cakey brownies. The whisking action in the recipe directions produces air bubbles which helps to gently leaven the brownies so they’re not too dense but perfectly fudgy. 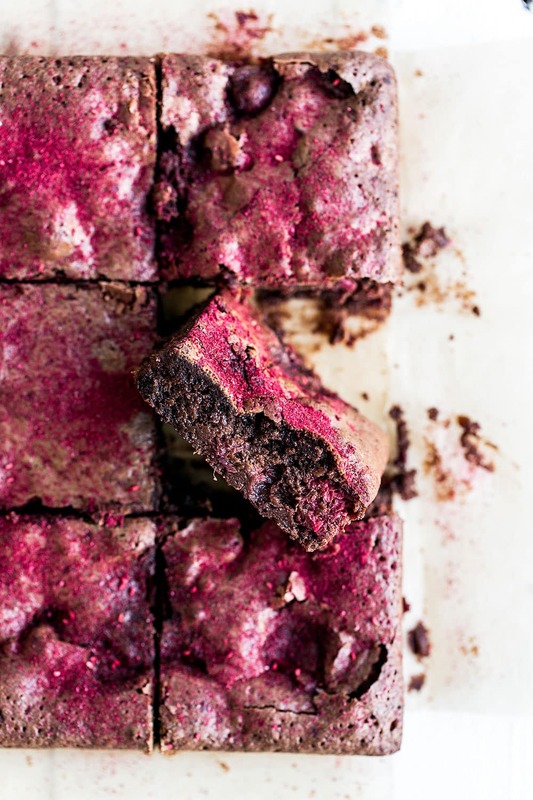 Of course the chocolate chunks and raspberries also help amp up the gooey factor here! In this recipe we add raspberries to the batter. They become ooey and gooey as they bake! You can use fresh or frozen raspberries, just don’t thaw first if using frozen. For a super pretty garnish and an extra dose of raspberry flavor, I like to sprinkle pulverized freeze dried raspberries on top. This makes for a perfect natural punch of color for Valentine’s Day! You could even make heart shaped powder stencils for a super adorable design. You can find freeze dried raspberries on Amazon or at Trader Joe’s or Target, near the other dried fruit. Pulverize with a blender, food processor, or simply in a plastic bag with a mallet, rolling pin, or heavy pan. Use a very fine mesh strainer to sprinkle over the brownies. If you want to remove the dried raspberry seeds, filter the powder through the strainer a few times. This OXO Baker’s Dusting Wand is absolutely perfect for sprinkling powder over any baked goods. If you want even more raspberry flavor, you can add a tablespoon of raspberry liqueur to the batter, such as Chambord. To ensure you don’t accidentally add too much flour or cocoa (which is very easy to accidentally do), I would recommend using a digital kitchen scale. At the very least, be sure to lightly spoon your flour and cocoa into your measuring cup so you don’t unintentionally compact too much into the measurement. You can read more about how to measure flour correctly to improve your baking here. Glass or ceramic baking pans will take LONGER to bake these brownies and the center may never cook through completely. Do NOT overbake brownies. There should absolutely be moist crumbs attached to a tester by the end of the baking time. Err on the side of underbaking here as the brownies will continue to cook from the residual heat after you pull them out of the oven. I like to line my pan with parchment or foil, leaving an overhang so I can easily lift out the entire pan of brownies to cut and serve. A big sharp knife, or even a large plastic knife, helps to make neat squares. If you want even cleaner cuts, refrigerate the brownies before slicing. I personally prefer these brownies served warm, so I’ll pop a square in the microwave for about 10 seconds or until the chocolate chunks are melty. Brownies can be stored in an airtight container at room temperature for up to 2 days, or in the fridge for 5 days. To keep them as fresh as possible, only slice the brownies just before serving. You can easily double this recipe and bake in a 9 by 13-inch metal baking pan for about 35 to 40 minutes. 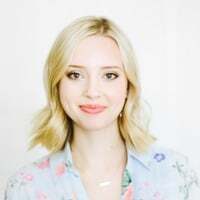 If you’re still curious about how baking ingredients and techniques work, and how I create my recipes using the science of baking, then I have a little invitation for you. Come join me in my online baking class The Magic of Baking. Everything in the class is already there, waiting for you to go through at your own time at your convenience. I go in depth on how baking works so you can have complete confidence every time you enter the kitchen. Learn more about The Magic of Baking here. Preheat oven to 350 degrees F. Line a metal 8-inch square pan with parchment paper. In a large microwave-safe bowl combine the chocolate and butter. Microwave in 30-second bursts, stirring between each burst, until the mixture is melted and smooth. Add the sugar to the hot butter mixture and whisk vigorously until combined. Allow to cool until just barely warm. Add in eggs, yolk, raspberry liqueur (if using), and vanilla extract and whisk vigorously for about 1 minute, or until the batter is very well combined and slightly ribbony. This helps create that shiny crust on top. Use a rubber spatula to stir in the flour, cocoa powder, and salt until just combined. Stir in the chocolate chunks and raspberries. Pour into prepared pan and smooth out. Bake for 30 minutes. Let cool in pan for at least 30 minutes before slicing. Brownies can be stored in an airtight container at room temperature for up to 2 days, or in the fridge for 5 days. Before serving, pulverize the freeze dried raspberries either in a food processor, blender, or in a ziptop bag with a rolling pin or mallet. 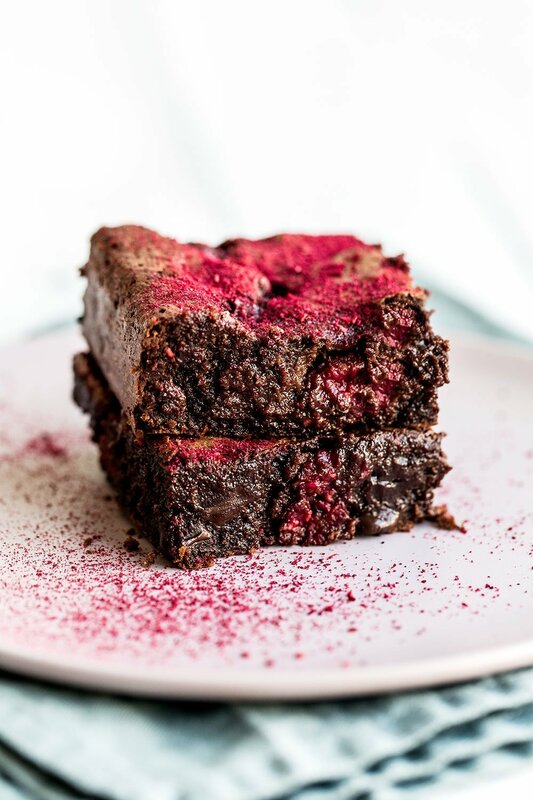 Use a fine mesh strainer to lightly garnish the pulverized raspberries over the brownies. For a finer texture and to remove the dried raspberry seeds, sift a few times before garnishing the brownies. I’m simply wondering if it’s possible to create a fresh raspberry whipped cream or buttercream topping. Which would be a better choice, if it is doable…so that the brownies wouldn’t end up soggy on top? Thank you! I’m not a huge fan of gooey brownies. Would they turn out well if I left out the chocolate chunks? Yes, you can leave out the chocolate chunks. Totally agree that brownies > cake most of the time! LOVE the addition of raspberries. That dusting of the freeze dried raspberries on top is so pretty! Thanks! Will they turn out very cakey or will they still be fudgy and chewy? Do you think that it would be good if i make a vegan version of the brownies with flax egg? Oh, Tessa. These brownies. HEAVEN!!!! I love the raspberry chocolate combo and this was just perfect! These turned out AMAZING! SO delicious. Chocolate and Raspberries are such a great combo. I did not take a picture but I made these 3 times. Just want you to know how FABULOUS they are. I used all (high quality) bittersweet chocolate & chocolate topping, couldn’t find freeze dried raspberries. Just a Fantastic recipe especially if you are a chocolate lover….Oh My!